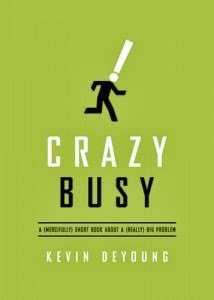 When I saw the title - Crazy Busy: A (Mercifully) Short Book about a (Really) Big Problem - I knew I wanted to read Kevin DeYoung's latest book. Why? Because, as he correctly assumes, I (along with pretty much every other person) feel crazy busy and would like not to feel that way. And sometimes it takes a book to slap us in the face and change things. And sometimes you read something because you know you ought to, because you know you have a problem and the reading of the book may or may not have a big effect. As DeYoung also points out, it's hard to figure out the balance (he's still trying) and slowing down the pace is going to have to remain a busy work in progress. DeYoung assures the reader from the get-go that he is absolutely not writing this book because he's got all the answers on how you can simplify your life. This, more than any other book he has written, is personally directed at himself. His life is full and he doesn't really know how to fit in all of the activities. Writing the book slowed him down, briefly, but he is not perfectly relaxed, calm, cool and collected. He still wants to be. In this book, DeYoung overs a small handful of reasons as to why we keep ourselves so busy. The chief reason being pride which exhibits itself in various ways. One particular area that he notes (that I, uh, sort of identified with) is a desire for prestige. As much as I can know myself, I don't blog about books online to be known by others. However, there is a part of this activity and the format that enjoys being noticed. (No need to stop commenting to "teach me a lesson" or anything. You can still be my friend and all that.) But it is easy for me to get caught up in the idea that I have to post something here or else I'll start losing my audience. As DeYoung points out, online social networking causes us to care more about 1,000 people we don't know than a handful of people who rely on us daily for everything. When the blog gets more attention than my household does (and it was doing that for awhile) then I'm in the wrong when it comes to sitting down and writing up blog posts. This is an area that I definitely have to pay focused attention to make sure that it isn't just a job (that doesn't pay!) but something that is truly an enjoyable outlet for me that doesn't detract from my responsibilities and joys in caring for my home and family. Another reason he lists for us (speaking generally) being busy is that we have our own little messiah complexes. "If I don't do it, who will?" We assume that projects and activities require our personal involvement to succeed. DeYoung references a sermon he once heard given by a Gordon Hugenberger. The topic of Hugenberger's sermon was John the Baptist's statement, "I am not the Christ." DeYoung points out that John the Baptist freely confessed that he was not the Christ and yet we frequently assume that we are. We think we can do anything, be involved with everything and be all to all people and the plain fact of the matter is that - we can't! DeYoung encourages us to also freely admit that we are not the Christ, but that we do need Him. We are, as a society, too busy. And because we're so busy ourselves we expect everyone else around us to be also and to respond to our needs and demands promptly so that we can continue on in our important busyness. When we send e-mails, we expect instant answers. DeYoung encourages us to not only slow down our own pace, but give leave to others to provide slower responses to e-mails, texts, phone calls, etc. Give grace because you also need grace. He also offers practical advice such as intentionally not using modern technology. Give up Facebook for a day or a week (or forever) and pick up the phone instead. Don't text or pull up your smart phone every two seconds to see if anything dramatic changed in your screen world. Back away from technology just a tad and see how much it allows you to breathe and do the things you truly need to be doing - the best things - instead of filling up your time with shallow banter. Mostly, what DeYoung does is point us to the only hope for a cure from the overwhelming stressful busyness is to set aside time for Christ. I did indeed find this book to be mercifully short (10 very quick and short chapters) with some good food for thought on how to intentionally slow life down, taking time for much needed rest, to set priorities and to seek Christ first, always and at all times. If you're busy in a stressed out and unpleasant way, I would recommend this book just to get you think about what it means to be good busy and how to eliminate the bad busy from our extraordinary and altogether glorious lives. Many thanks to Crossway Books for providing a copy of this book in order to facilitate this review. My thoughts, should you doubt it even a little bit, are always entirely my own. I have received no further compensation for writing this, excepting the encouragement to slow down. And I have to do that anyway because at the conclusion of writing this post my internet connection slowed down to the speed of a snail on sleeping aids and I'm being forced to sit still for longer than I intended. I had read Challies' review of this and wasn't much interested because he evidently doesn't present any answers or solutions. But then sometimes thinking about causes does help us analyze the problem and see where we need to make changes, so I can appreciate its value more now. And, as you pointed out, managing our time is always going to be a work in progress. "I am not the Christ." I have never thought of John's words in this context, I LOVE it! I was given the mini intro version and liked what I read. I didn't request a copy bc I'm trying to scale down on the requests...but I still want to read it! Sounds like a good premise. I think, in some respects, "busyness" has become almost an idol today. It's as if you are more important if you respond to the query "how are you?" with "oh busy! Good, but busy!" At the same time, I am terribly busy. grin But it's really just such a busy season and it's a good busy. I feel like I've gotten pretty good at evaluating what I should and should not be doing (wisdom from my old age, ha ha). But one thing that God has shown me in the last year or so is that if I go on and on about how "busy" I am -- IF I am doing what I know He's called me to do -- then that is not glorifying Him at all. I know that oftentimes we do take on too much, but if I am "busy" with the 2 ministries He's given me, plus caring for my family, plus things He's given me the okay to do personally for my own well-being, I shouldn't complain when I am hit with a particularly busy week, even if He asks me to do something else, like reach out to someone. But busyness is a problem, and I've definitely known when I got in over my head without seeking His will for me. Sounds like an interesting book. I just checked our local library, and they don't have it--quite surprising, actually, since the author was a pastor in our small town for a couple years! I confess I have high expectations--for myself and others--regarding speedy email replies. Kudos to you for deactivating the Facebook. Never been a fan and don't have time for it. This book sounds really great. My husband and I sound very much like you and your husband. We have to be constantly doing something. Hand or brain must be active at all times. Productivity! We must be getting something accomplished. Oh, one day we will wake up and find we have gotten old and the world has passed us by. But, it is something like an addiction. How do we stop the roller coaster? I do look forward to the winter months because the Lord gives us this time to hibernate for a few months. I am going to have to look this one up.